ABL’s Clinical Intelligence (CLINTEL) solution provides a single platform for study analytics. No reconciliation, no more decisions based on inaccurate or incomplete data, no more manipulation of data to make it match reality, no more capturing the same data in multiple systems. Our solution allows your data to work for you instead of you working to access your data. Installation is available in both cloud-based Software-as-a-Service (SaaS), and on-premises configurations. Developed using industry-proven architecture that boasts fast time to implementation, superior visualizations, and technology that is focused on users (e.g. study managers, CRAs, data managers, clinical trial assistants, etc.) as opposed to Information Systems experts. Data management modules provide fast and accurate insight into current and future workload; trends in data error rates; and risk trends related to site, page, datapoint and CRA among others. This information can help to identify and mitigate issues early and accurately. 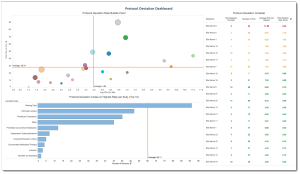 Our Risk-Based Monitoring metrics splashboard provides an at-a-glance view of your study’s risk profile, identifying the sites at highest risk. CLINTEL also uses industry best practices to provide risk scores for key areas related to Risk-Based Monitoring. CLINTEL helps speed time to benefits realization by providing cross-functional, cross-study metrics for operational management of clinical trials. Utilize data from past studies to plan more accurately for new studies; identify issues accurately and early, so that key program and study decisions can be made earlier. CLINTEL provides end users with fast and flexible ad hoc reporting capabilities. From tables to bar charts to box and whisker plots, CLINTEL allows non-technical end users to create visualizations that meet their needs, in minutes. CLINTEL is capable of combining study data from multiple sources, providing a single source of the truth for key information for studies, sites, CRAs and other data groupings. Providing comprehensive insight across an entire program, removing the data silos, reduce data capture redundancy among systems, thereby increasing data accuracy.